Use our map above to explore Cabo San Lucas, San Jose del Cabo, Pedregal, the Tourist Corridor, East Cape, La Paz and Loreto. Each map indicates local streets, highways and beaches, and has active links to individual villas and resort listings. The Pedregal is the ‘Beverly Hills’ of private residential gated communities in Cabo San Lucas. Despite 30 years of steady growth, the Mediterranean-inspired community still manages to hold onto its Old World atmosphere while simultaneously embracing the new. Built into a magnificent granite hillside surrounded by exotic desert vegetation, the area's 360 acres feature sweeping panoramic views over either Cabo San Lucas Bay or the Pacific. With cobblestone streets, fine restaurants and numerous recreational options, the emphasis is on privacy and a casual, tropical lifestyle. Exquisite showpiece homes abound. Excellent swimming is available at Mèdano Beach, less than a mile away. The Pedregal is an oasis of exclusivity just steps to all the action of downtown and the marina. Warmer than the Pacific side, the Bay side showcases the city lights at night and lovely sunrises. You can walk to Mèdano Beach and downtown Cabo San Lucas from the Bay side of the Pedregal community. The Pacific side of the Pedregal offers stunning ocean views, with whale watching right from the terrace of your luxurious private villa. The beautiful stretch of beach along the Pacific is perfect for sunbathing and beachcombing. Big Pacific waves make this beach unsuitable for swimming. Located on the Pacific side past the Pedregal, Sunset Beach is home to the beautiful Pueblo Bonito Sunset Beach Resort & Spa and the Pueblo Bonito Pacifica Holistic Retreat and Spa, an adults-only luxury resort. Relax on the broad expanse of beach offering a wonderful feeling of seclusion and privacy. Surrounded by granite mountainsides, the beach is known for its nesting sea turtles. A release program is available to help usher the tiny baby turtles safely into the sea. A spectacular setting for deep relaxation, this beach is not suitable for swimming. Surrounding the Marina area, downtown Cabo San Lucas is the lively epicenter of Cabo’s fame (and notoriety). You’ll find a bit of everything here from gourmet restaurants and luxury boutiques, to local taco stands and outrageous nightlife. Think spring break, Cabo Wabo and Squid Roe. Parking is very limited downtown so grab a cab or take a stroll. If you’re looking for kitschy souvenirs or truly unique local arts, you’ll find them in downtown’s many shops. The beloved beachfront of Cabo San Lucas, Médano is an energetic blend of spectacular beach, beautifully azure swimmable waters, activities and of course people. Hot beach clubs, beautiful resorts and fun restaurants line the beach. Hang out at the Mango Deck, Billygan’s Island or The Office where you can enjoy happy hour with your toes in the sand. The gentle waters of the Bay are a beautiful backdrop for kayaking, jet skiing and parasailing. While soaking in the sun on the beach, you’ll encounter a host of local hawkers selling anything from jewelry to chewing gum. If you’re interested, bargaining is expected; if not, ignore them. If you’re looking for a hot mix of action and natural beauty, Médano is the place to be. Depending on where you’re staying on Médano Beach, you’re either just a short cab ride or walk to downtown. Cabo Bello is on the Corridor, overlooking the Sea of Cortez. The neighborhood is within a few miles of downtown Cabo San Lucas; most properties have a view of Land's End. The area has a swimmable beach, with a protected cove, also called Cabo Bello. Large stores like Costco, Home Depot and Wal-Mart are nearby. The Cabo Bello neighborhood is three miles from Cabo San Lucas. A neighborhood within a neighborhood, Puerta del Sol is background to Jack Nicklaus' Ocean Course, long ranked one of the top 100 courses in the world. The seaside neighborhood is home to private and beautifully appointed two- and three-room condos and villas, with a rich list of amenities. All this, and just a short 5 mile drive to downtown Cabo's many exciting activities! Rancho Cerro Colorado is an exclusive gated residential neighborhood just south of Palmilla, approximately 5 miles from downtown San José del Cabo. To the north and west are the striking Sierra de la Laguna mountains, to the south is the Sea of Cortez. Many world-class golfing venues are close by, and the cove is safe for swimming. An exclusive oceanfront gated community located between the championship golf courses of Cabo Real and world-famous Palmilla, Cabo Colorado offers beautiful estates, a pristine beachfront and magnificent views of the Sea of Cortez. Minutes to historic San José del Cabo, Cabo Colorado is a great choice for a tranquil getaway with convenient proximity to the Corridor’s finest recreational offerings. Another one of Los Cabos' premiere gated residential communities, Punta Ballena means Whale Point, so that tells you that this might be a fine spot from which to view these leviathans. Punta Ballena is a few miles outside Cabo San Lucas, but is still known for its feeling of remote beauty. Many Punta Ballena homes have dramatic views of Land's End and the rugged Baja coastline. Punta Ballena also offers more than two miles of walking paths, private tennis courts and a residents' beach club. This neighborhood is home to the Esperanza resort. With spectacular views of the Sea of Cortez and Land's End, Santa Carmela is another of Los Cabos' exclusive gated communities. It's a very quiet neighborhood with a very secure entry. It's known for its tranquil feeling and traditional architecture. Santa Carmela has of the most spectacular views of the bay of San Lucas and the famous El Arco. Just minutes from world-class golf, beaches, and downtown Cabo, Santa Carmela is a perfect spot for watching the sun go down. The nearby beach isn't safe for swimming, but there's a beach club and the area is nice for sunning. 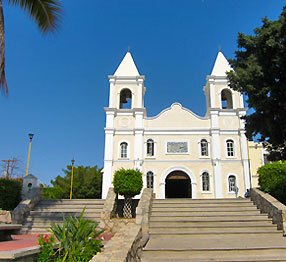 San José del Cabo is a charming city boasting a traditional town square, historic architecture, a thriving arts district, romantic courtyard restaurants and a delightfully laid-back pace. The quieter part of Los Cabos, San José is a striking counterpoint to the energy and bustle of Cabo San Lucas. Miles of sandy beaches are perfect for strolling and sunbathing, although strong surf here make the inadvisable for swimming. Alongside the historic town, the lush San José estuary is a natural palm oasis that flows into the Sea of Cortez. This private golf community of luxurious homes is located in an excellent location approximately 5 miles to downtown San José del Cabo. 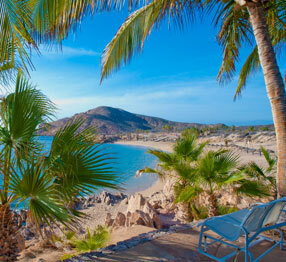 Puerto Los Cabos is one of the area’s rising stars. This luxurious development is located just outside of San José del Cabo and features a world-class marina alongside the traditional fishing community of La Playita. Puerto Los Cabos features breathtaking oceanfront homes, an excellent golf course, beautiful views of the Sea of Cortez, dining, resorts and more. Situated just beyond Puerto Los Cabos, El Encanto offers a tranquil setting overlooking a pristine beachfront and the shimmering Sea of Cortez. This peaceful development is the ideal setting for guests seeking a quiet and luxurious getaway in a setting of exceptional natural beauty. This peaceful beachfront area offers a tranquil laid-back pace and stunning views of the Sea of Cortez. Pristine beaches invite sunbathing and long strolls. This area is located approximately 15 minutes by car from downtown San José del Cabo. Buzzard’s Grill is located nearby.